Print is undoubtedly one of the most varied, creative and innovative industries in the world. While the industry is split into a whole host of different markets, some of these are split into further, separate areas, thus demonstrating the amount of work that it available. Due to the different types of work on offer, one of the most diversified markets is textile print. Ranging from t-shirts and dresses, to flags and cushion covers, those active in this sector take on all sorts of projects, and while this may be positive in that there is lots of business to be won, it can also mean print service providers (PSPs) can face heavy demand from all types of customer. One of the most effective ways of dealing with this is by investing in new kit and in the textile print sector, there are plenty of options on offer from some of the largest manufacturers in the industry. Here, we take a look at some of the latest solutions available and examine the benefits they can offer to PSPs. Epson is one of the most respected manufacturers in the print market and is able to offer technology solutions for various types of work, including textile print. Aside from the SC-F2000, Epson can also offer the SureColor SC-F9200; a 64-inch device that has been designed for high-quality production of textiles for clothing and sportswear, décor and home furnishing textiles, as well as soft signage and flags. The machine can hit speeds of 100sq m/hr in draft mode, 56sq m/hr when in production mode, and 27sq m/hr in quality mode. Also featured in the SureColor range is the desktop Epson SureColor SC-F2000 direct-to-garment printer for the on-demand printing of a variety of garments, as well as tea towels, aprons, cushions, tote bags and other applications. In addition, Epson has recently been working with For.Tex on the Monna Lisa, a new digital direct-to-fabric production printer available in widths of 180, 220 and 320cm. 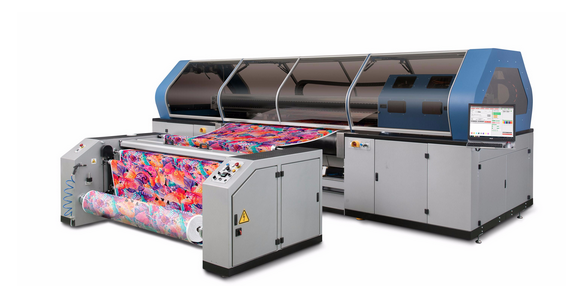 Also active in this sector is Roland DG, and Mark Elvidge, business development manager for the manufacturer’s UK arm, said the firm’s Texart dye-sublimation printer and ink range of solutions can help PSPs access key work in this market. Elvidge said: “With the trend for shortening fashion cycles and the desire for personalised and customised items, the demand for digital printers which can accommodate efficient high-mix, shorter-runs and design prototyping continues to increase. Roland's Texart range delivers exactly this. Elvidge went on to highlight other solutions from Roland DG, such as the updated RIP software. Included with Texart printers. ErgoSoft Roland Edition 2 has more than 40 new features and enhancements compared to the previous version, and Elvidge said has enjoyed a warm response from the market.